WASHINGTON (CNS) — The chairman of the U.S. bishops’ Committee on Migration welcomed a federal appeals court ruling that upheld a temporary restraining order against President Donald Trump’s travel ban on refugees from seven predominantly Muslim countries that also temporarily suspended the country’s refugee resettlement program. “We respect the rule of law and the American judicial process. We remain steadfast in our commitment to resettling refugees and all those fleeing persecution,” Bishop Joe S. Vasquez of Austin, Texas, said in a statement Feb. 10. “At this time we remain particularly dedicated to ensuring that affected refugee and immigrant families are not separated and that they continue to be welcomed in our country,” the statement said. In a decision issued late Feb. 9, a three-judge panel of the 9th U.S. Circuit Court of Appeals unanimously rejected the government’s argument to lift the freeze on the president’s order and maintained that the court had jurisdiction in the case as a check on executive power. The case was filed by the state of Washington, which argued that Trump’s order was unconstitutional because it discriminated against Muslims and that state agencies were harmed because students and employees were barred from re-entering the country. The state of Minnesota subsequently joined the lawsuit. U.S. District Court Judge James Robart of Seattle halted Trump’s travel ban Feb. 3 by granting a temporary restraining order. 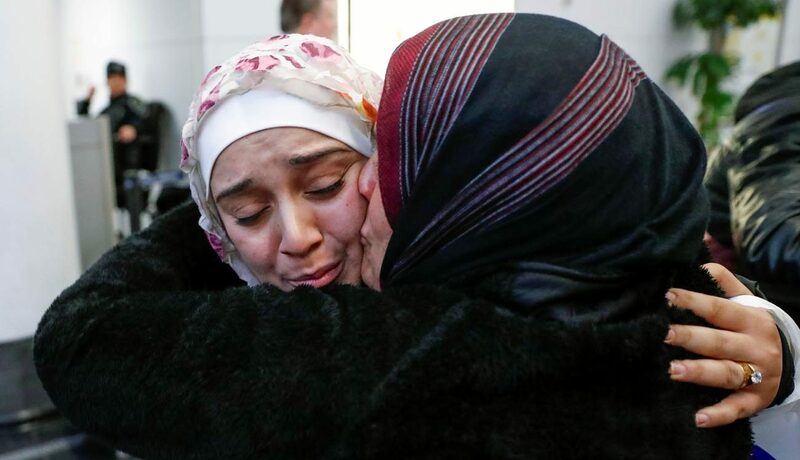 Several lawsuits have been filed challenging Trump’s Jan. 27 executive order that suspended the entire U.S. refugee resettlement program for 120 days and banned entry of all citizens from seven majority-Muslim countries — Syria, Iraq, Iran, Sudan, Libya, Yemen and Somalia — for 90 days. In its 29-page ruling, the appeals court said the administration’s lawyers had provided no evidence that refugees from the seven countries named in the ban posed a national security threat through terrorism. The judges also wrote that the government had not shown Trump’s order provides any avenue for those restricted from traveling to the U.S. to appeal the decision or seek a hearing to present their reasons for entering the country. The decision said that earlier court cases had determined that the protections established under the due process clause in the Constitution’s Fifth Amendment “apply to all ‘persons'” within the U.S. including aliens whose presence is “lawful, unlawful, temporary or permanent” as well as to people attempting to reenter the U.S. after traveling. is this the same church that doesnt want judges (aka kennedy) to make law? where is the respect for the rule of law?